Currently Professor of Arabic at Jawaharlal Nehru University New Delhi, he started his teaching career in 1970 as lecturer in Arabic language and literature at Hajee Karutha Rowther Howdia College in Uthamapalayan, Tamil Nadu and joined the Jawaharlal Nehru University in 1974 as Assistant Professor of Arabic. During June 1995 to Jan 1999 S.A. Rahman has served as Director of Maulana Azad Centre of Indian Culture in Cairo, Egypt. He has a number of publications to his credit including books & articles in Arabic, English, Hindi and Urdu. He has also translated and published a number of books and stories from and into Arabic, into Hindi and Urdu. He is also a recepient of President of India's award for promotion of Arabic language in India. 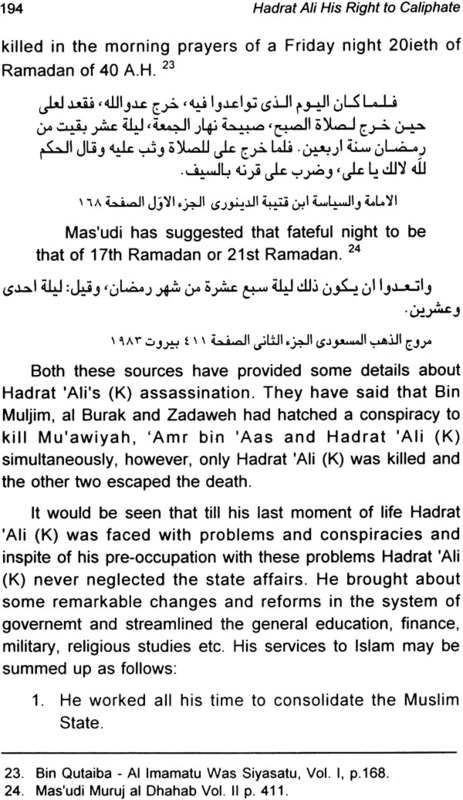 Hadrat AIi His Right to Caliphate throws light on the religious and political aspects of the life of Hadrat Ali (R.A). It also shows that the religion and the politics are things integral to other. 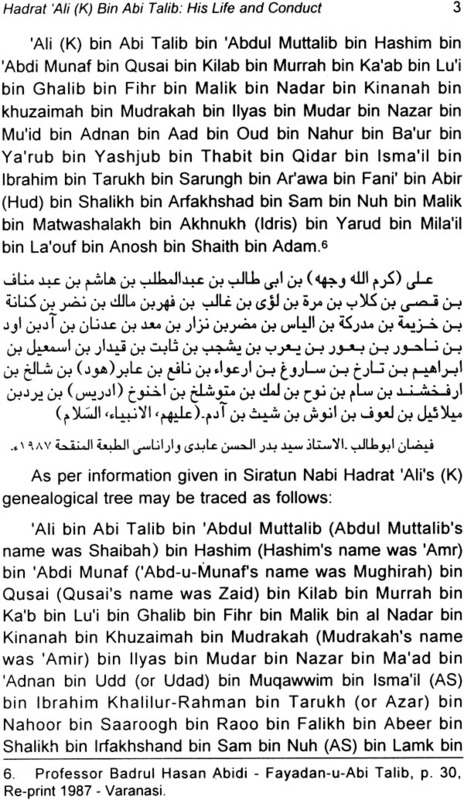 AIi was a close relative to the Prophet (Peace be upon him) and the first male Muslim. If he expected the caliphate he was right. 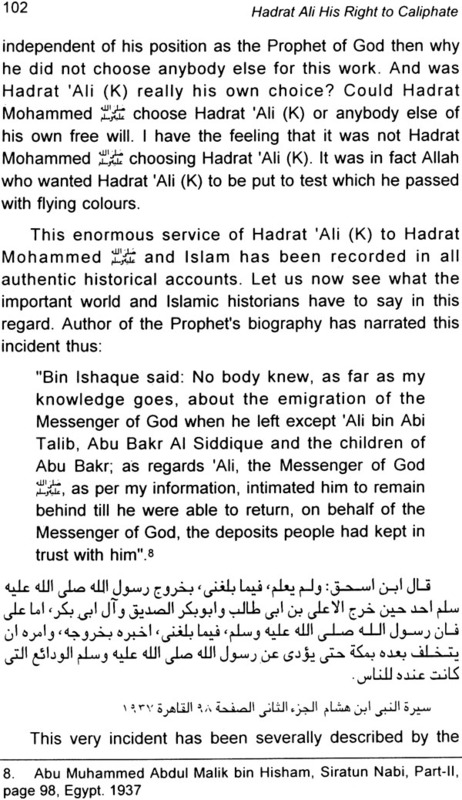 He was also the advisor of the three caliphs namely Abu Bakr, Umar and Usman. This book narrows the widening gap between the two important groups i.e. Shias and Sunnis. It is an objective study and a valuable work on the subject. In the Islamic perspective or say, in the perspective of any religion worth its name, it would be seen that life in this world revolves mainly, if not solely, round three things. They are by name (1) Family life i.e. collective living in units of husband, wife and children. These numerous units together make society, (2) Economy i.e. material i.e. money in modern terminology and (3) Politics. Other aspects and spheres of the worldly life are governed by these three elements or they are totally dependent on them. If these vital elements of human life are contained within reasonable limits then life on earth becomes desirable. Proper management of society, economy and politics generate a lot of comforts and happiness which things are ultimate in this earthly world. However, to regulate these three components of worldly life is not an easy task. Over centuries in the post from time to time man has tried to invent means and ways to regulate family and social life including its material and political elements. They have found that religion is one such factor which imposes restrictions on mankind to contain their activities within reasonable limits of decency. As a Muslim I consider Islam to be the last word in the field of religions in this world and the king of all religions. It provides most moderate, acceptable and practicable measures to regulate this human society. In this fast deteriorating world it has become highly essential to talk about Islam, its peerless values and the good lessons it teaches us. As I firmly believe that talking about values of Islam as theory will not help much in improving the living condition in this world I thought it necessary to present these values through the practicability of these Islamic values which have always contributed in moulding this world-society since its inception from the early seventh century of our current era. 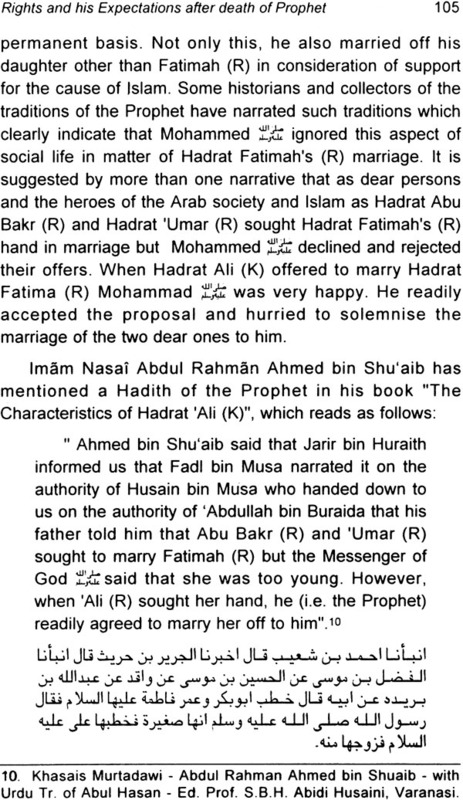 My choice in this regard fell on Hadrat 'Ali (R) for more than one reason. First, because he was the first natural male Muslim after Mohammed himself. 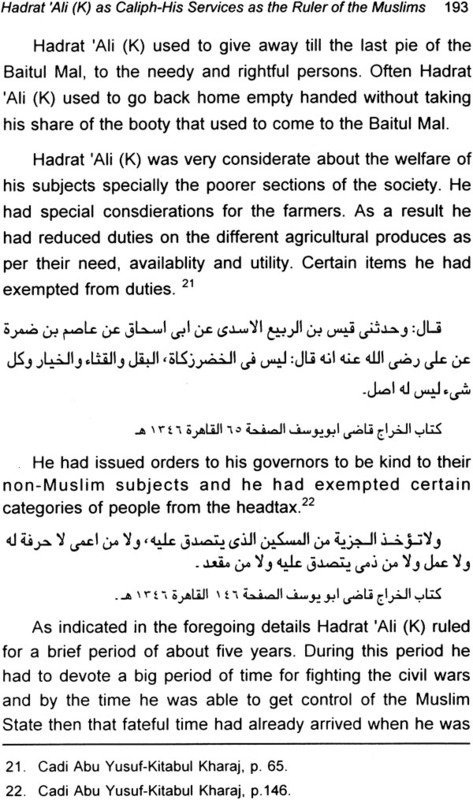 Secondly, because he belonged to the core family of the Prophet Mohammed Thirdly, and most prominently, because he rendered selfless services to Mohammed Islam and Muslims. It would be seen that Hadrat "Ali (R) spent each moment of his life and each penny of his earnings for the welfare of Muslims without any material expectation in return therefore. 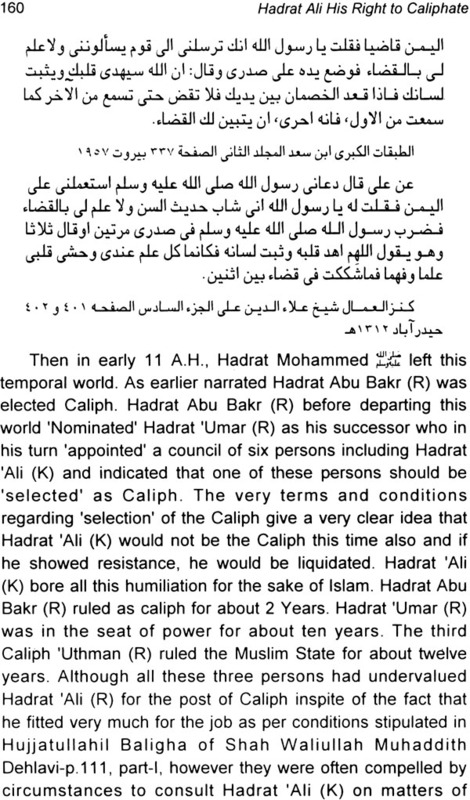 Although there has been a widespread feeling that Hadrat 'AIi (R) wanted the caliphal post for himself after the death of Mohammed t~ however, the history of Islam does not provide any indicative that Hadrat Ali (R) ever manipulated to become the first caliph after the prophet's death. Very unfortunately some authors have considered his disinterest in asking or working for the caliphal post as a strong point of manipulation. Infact, any action of an individual can be severally interpreted. Hadrat AIi (R) is no more with' us. Similarly there are no such people who can give us exact and accurate information. We have only available with us information preserved in the folds of history. And now we have two groups strongly' biased in favour of their own ideologies. 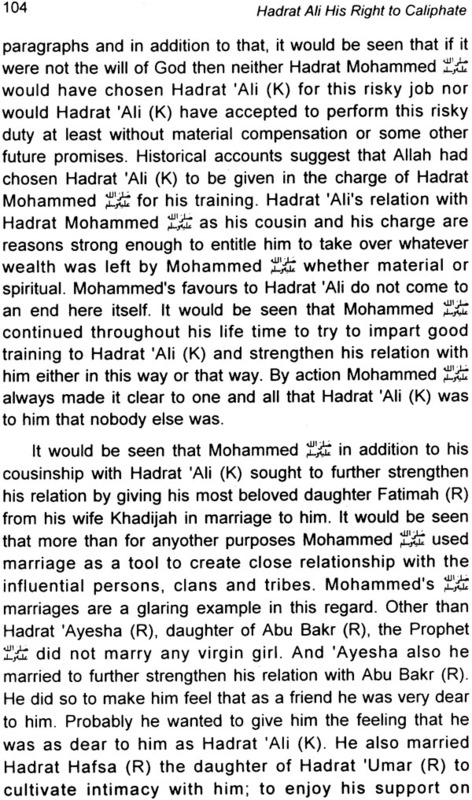 These two groups are (1) the Shias or those who advocate the right of Hadrat Ali (R) to succeed Mohammed who was his cousin and father-in-law and (2) the Sunnis or those who oppose tooth and nail the very idea of Hadrat 'All's successorship as a matter of right. From this point there ensues a very pique argumental combat and each group attempts to prove righteousness over the other. They brought forth textual proofs in this regard from the one and the same Islamic history and they have been differently interpreted to suit the purpose of the two diagonally opposite sects of the Muslims i.e. the Shias and the Sunnis. In this process both these groups conveniently forget that they are trying to harm Islam for the development and spread of which Hadrat 'Ali (R) laid down his life. 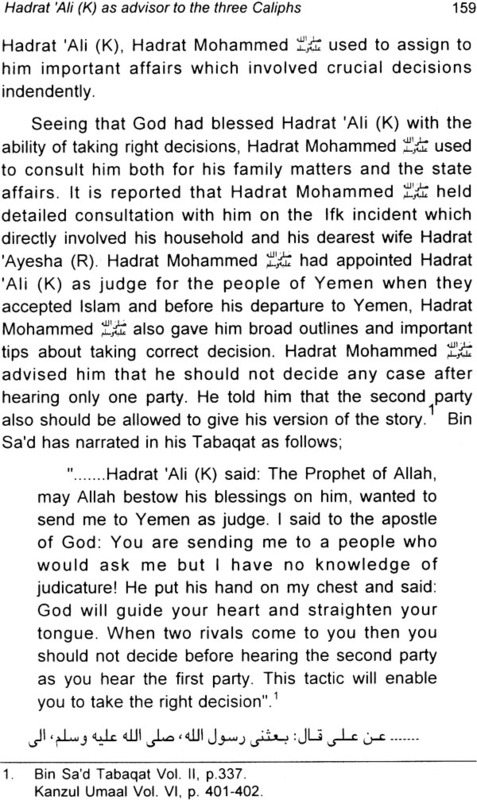 Whether Hadrat 'Ali (R) was rightful to be the first successor to the calipal post or not or whether there is textual proof or not to indicate that Mohammed wanted to appoint Hadrat Ali (R) as his successor, are matters of critical vitality to prevent the widening of the ever increasing gulf between the two important sects of the Muslims who are both well wishers of Islam and lovers of Mohammed Keeping this aspect in my mind I have chose to prepare a brief study titled: Hadrat Ali; his right to Caliphate. 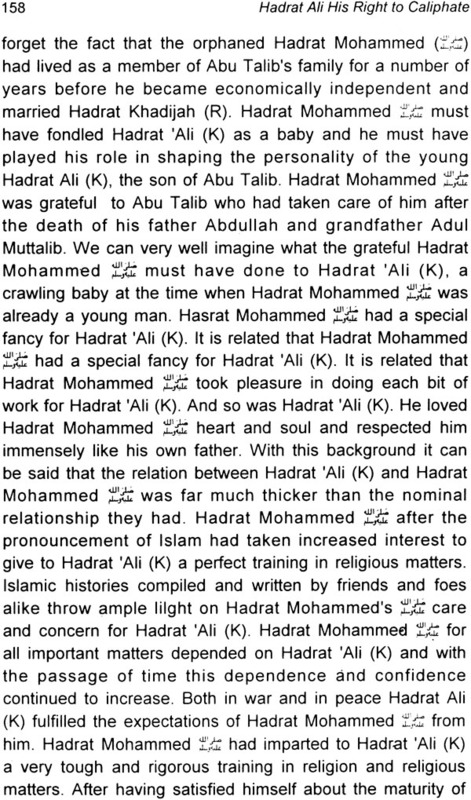 As indicated in the title itself, I have intended to throw light on the religious and political aspects of the life of Hadrat Ali (R). 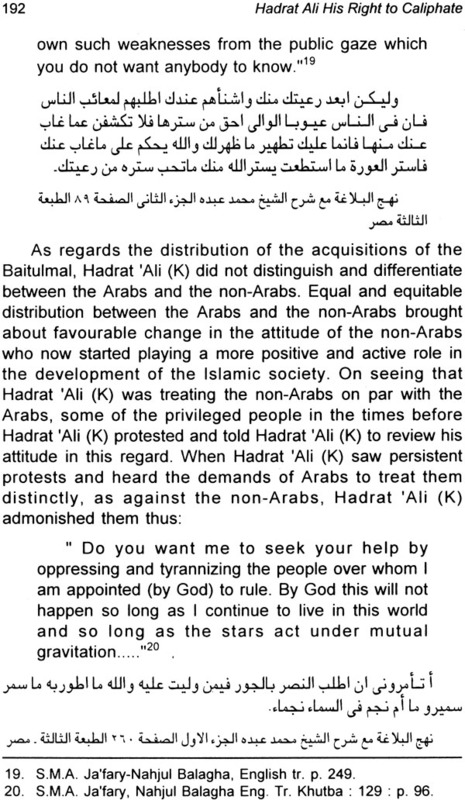 I have attempted to say that religion and political aspects of the life of Hadrat •.Ali (R). I have attempted to say that religion and politics are things each integral to the other or in other words they are inseparable and complementary of each other. We, infact, cannot imagine a religion devoid of politics and there cannot be good politics without religion. A ruler without applying religious restraints on himself, his desires and activities, cannot be a good ruler. 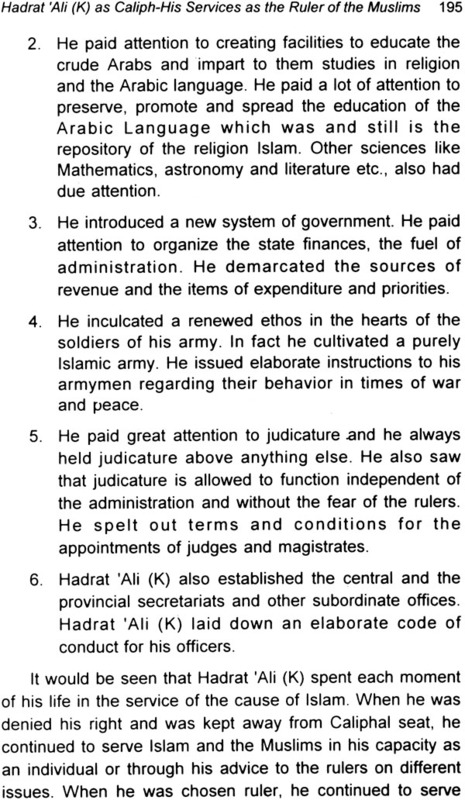 All aspects of Hadrat All's life including political, were closely guided by his religion and governed by the religious injunctions. 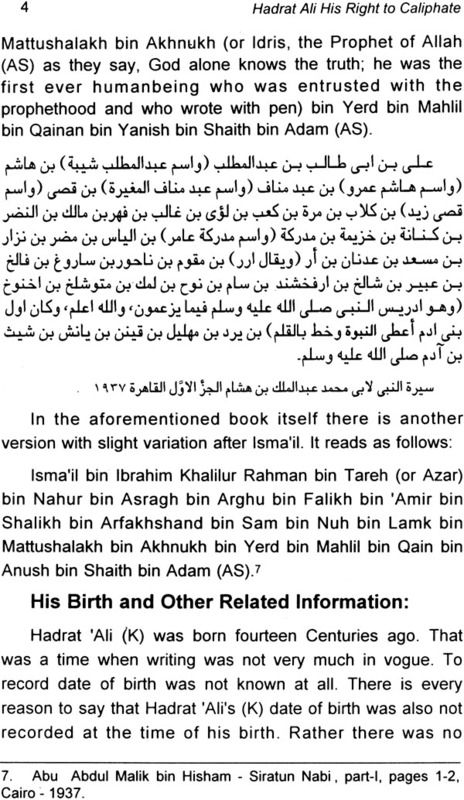 In this book I have humbly attempted to bring forth the rights of Hadrat 'AIi (R) as an individual and a close relative of Mohammed the Apostle of Allah. 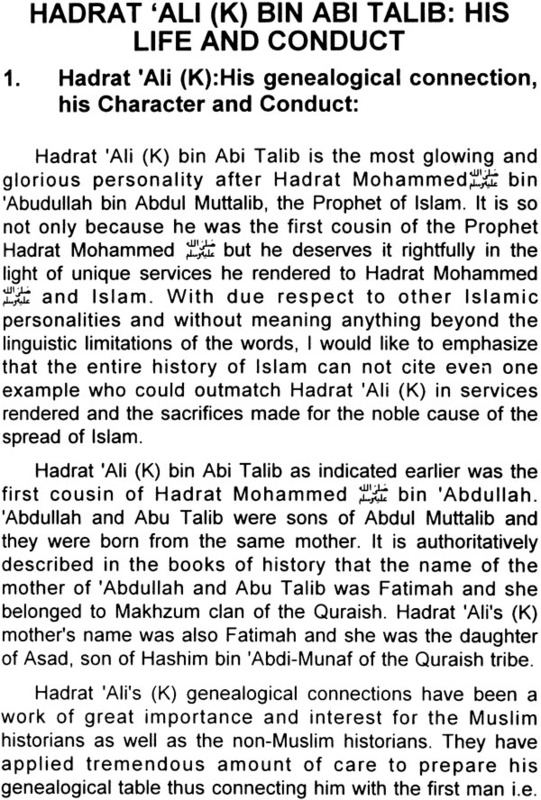 I have also discussed the possibility of Hadrat 'Ali (R) having some expectations to the successorship after the death of the Prophet. 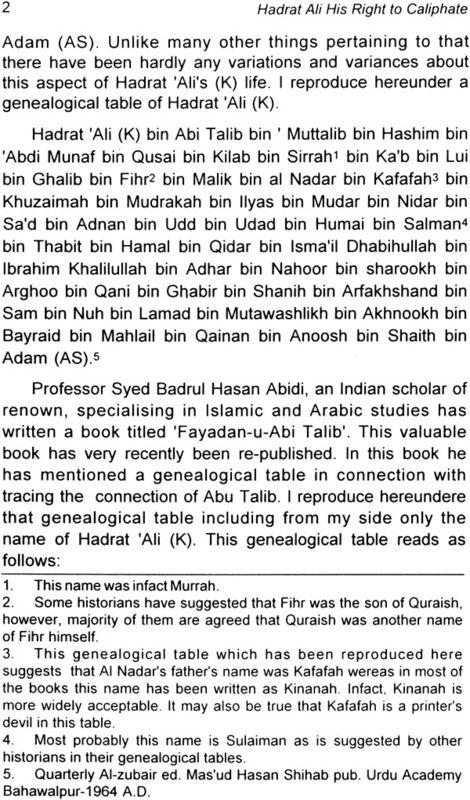 In this book I have also undersord Hadrat Ali's (R) advisorship to the three caliphs viz Hadrat Abu Bakr (R) Hadrat 'Umar (R) and Hadrat 'Usman (R). I have attempted to throw adequate light on Hadrat All's indispensability to the three rulers. It would be seen that the three caliphs and chiefly Hadrat 'Umar (R) depended so much on Hadrat 'All's advice in crucial matters for the obvious reason that Hadrat 'Ali (R) had learned wisdom and Islamic law directly from the Prophet. 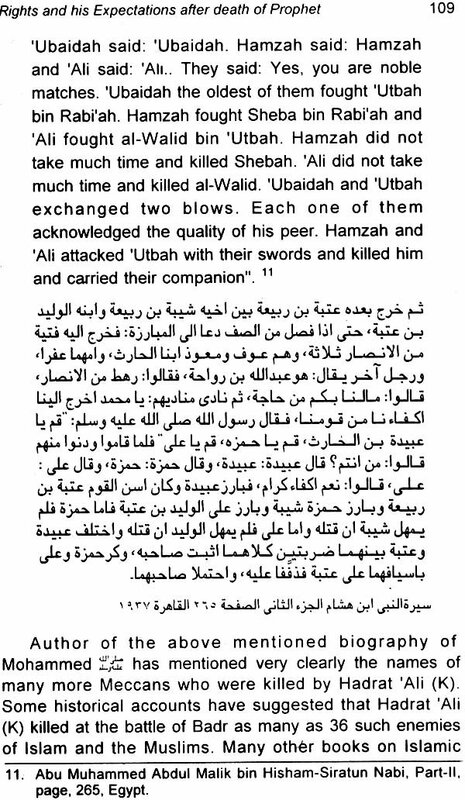 They all knew very well that Hadrat AIi (R) by virtue of being the first natural male Muslim and a close relative of the prophet had privileged opportunity to spend maximum length of time in the close company of the Prophet. In the folds of this book I have also mentioned some of the innumerable services Hadrat Ali (R) rendered to Islam and Muslims. All details in this book speak for themselves that Hadrat 'Ali (R) controlled and managed all aspects of his life in the light of provisions of Islam. He never allowed his personal whims and fancies to mislead himself and tear him away from the right path. The reason is very simple, obvious and not very far to seek. He could do all this and make all these sacrifices because his commitment to religion was very strong, sincere and unshakable. By following the tenets of Islam he became an ideal person and a matchless hero of the history of Islam.